The first appearance of what is going to be Queensland's biggest and best U18's festival, will be at RNA Showgrounds, Brisbane on the 13th April, 2013. The festival's lineup at the moment is locked into a all Australian festival. With their first announcement which has a little bit from each genre; screamo/alternative, dance, hip-hop & indie. 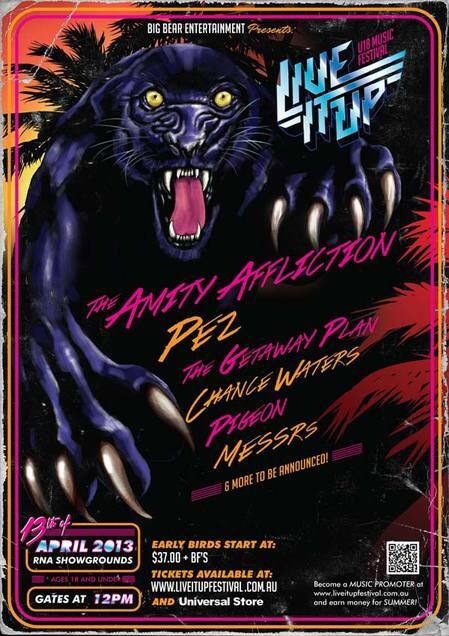 The line-up already is impressive with the likes of The Amity Affliction. The aussie band can be likened to A Day to Remember, Mayday Parade, Silverstein and so on. For the Australian hip-hop scene they've secured a spot for Pez. Pez sung alongside 360 in their first hit titled "The Festival Song" in 2008, which put him on the widely acknowledged Aussie Hip-Hop scene. Other artists that will be seen at Live It Up! are The Getaway Plan, an indie rock band - their most famous song being "Where the City meets the Sea". Pigeon and Chance Waters will also be appearing. Check out their website for more artist announcements as this tour will surely be an event not to be missed in 2012.